The Hotel known by the name of “Hotel Barrett” is situated at number 47 of Largo Torre Argentina in the recently renovated light yellow-coloured Palazzo next to the famous old Teatro Argentina of Rome, in which Gioacchino Rossini held his “Il Barbiere di Siviglia” début in 1816. The Palazzo was built directly above the ancient Forum of Pompeius (the biggest Forum of Imperial Rome with about 100 columns. The hotel faces the 4 temples situated onto Largo Argentina and datable as from the ancient Roman Republican Era (440 B.C.). The Hotel Barrett borrows portions of ancient walls and arches- recognizably from the Roman period by their construction technique – as, for example, in the hotel lounge. floor – one of the current Hotel Barrett’s storeys), has been faithfully reconstructed thanks to both in-depth research of original documents and studies of the original stone parts left over to our days and is now located in the Hall of the Hotel. In the Rome of the Popes, the supply of so-called “direct” flowing fresh water only reached a few of the richer people’s town mansions and, although people were already used to collecting water in special water-tanks or efficient cisterns, the lower classes had to fetch their water from one of the many street fountains or small drinking fountains (the so-called “nasoni” i.e. big noses). Have a water supply “directly” in-house at that time (between 1550 and 1700), even more so in one’s own apartment, was a sign of social distinction, of acquired privileges and power. The current aspect of the area opposite to the Hotel Barrett façade is determined by the archaeological site and result of the excavations made between 1926 and 1929, during Mussolini’s regime; such escavations brought a spacious holy area – the “Area Sacra” – to light, including the impressive ruins of the 4 temples datable as from the ancient roman Republican Era. These temples are among the oldest discovered up to date in Rome. 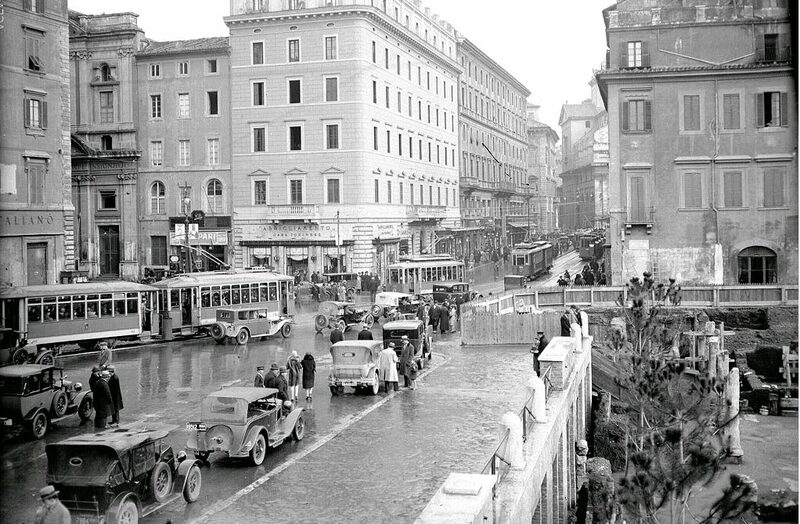 The building that hosts the “Hotel Barrett” stands on the site where the colonnade and eastern access to the “Teatro Pompeo” was once located. Erected by the Roman consul and triumvir Pompeius Magnus around 57 B.C., it was the first theatre of ancient Rome to be built entirely in stone and had a portico of about 100 columns. The size of the theatre is quite exceptional for the period, keeping in mind that the auditorium was 150 metres in diameter and had a stage of approximately 90 metres length; the theatre was able to hold at least 20.000 spectators. The four-sided porticus of arcades behind the stage was a real public garden complex, decorated with statues and with platanus copses bordered by fountains, ending in a large rectangular exedra used by the Curia for Senate meetings. 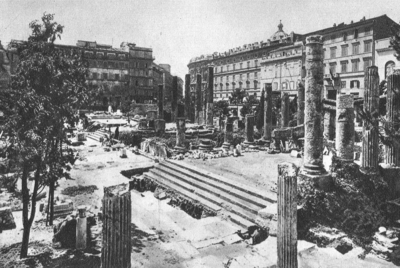 The old Curia Pompeia was located right under the building that is the current site of the Hotel Barrett. It is here, on the ides of March, under the statue of his political enemy Pompeius”, as historical tradition refers, that Julius Caesar was killed. The Statue is visible today at Palazzo Spada. 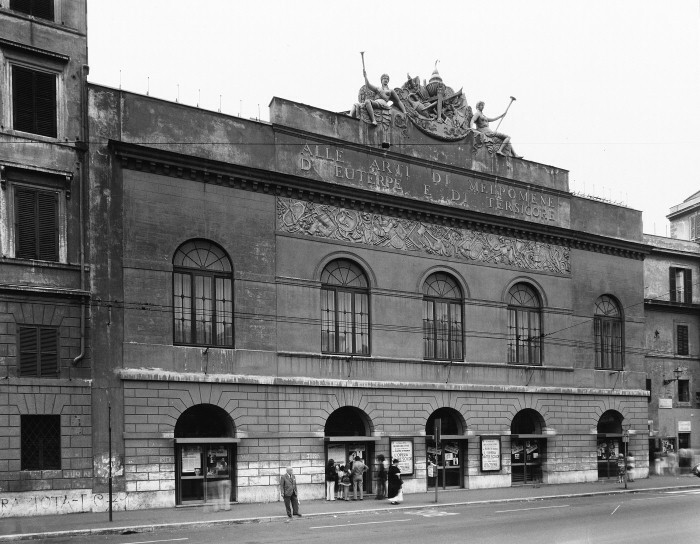 The “Teatro di Pompeo”, renovated during the reign of the Roman Emperors Settimius Severus and Caracalla (in 210 B.C. ), had two rows of central pillars aligned on the grounds of what is today’s Via dei Barbieri. It extended from from east ( with access to the theatre portico in correspondence to today’s Via di Torre Argentina) towards west, meaning that the hemicycle of the theatre included the current urban area between Via dei Giubbonari in the south, Piazza Campo dei Fiori in the west and Piazza del Paradiso in the north). The entire building of the Hotel Barrett occupies the area where once the Arcades and Curia of the Theatre of Pompeius stood. This area is directly overlooking the four Temples of the ancient Roman Republican Period (440 B.C.) forming the “Sacred Area” at the Torre Argentina of today. cartography of Rome: “Novissimae Urbis Romae Acuratissima Descriptio”, drafted by Mario Cartaro in the year 1576.